Chefchaouen, also known as the Blue Pearl of Morocco, is a little gem nestled in the Rif Mountains in the north of Morocco. In the past year it has become quite popular on social media and everyone dreams about wondering around the small narrow streets and blue buildings of Chefchaouen, myself included. As we were spending a long weekend in Fez, we could not leave without visiting Chefchaouen. However, we only went for the day and it was quite tiring to do the bus journey there and back as it's over a 4hour drive one way. I regret not having stayed a night in Chefcahouen to have more time to visit as the city is a lot bigger than I had expected, so I would definitely recommend this to you. Despite the rush, I'm so happy I got to see this beautiful city with my own eyes - it really is a photographer's paradise and I was blown away by all the charming little streets with the blue-rinsed houses and little blue doors, the quaint cafes and the sweet souvenir shops. I hope that the next 20 photos will get you dreaming about Chefchaouen and make you organise a trip there soon. Trust me - you won't be disappointed! 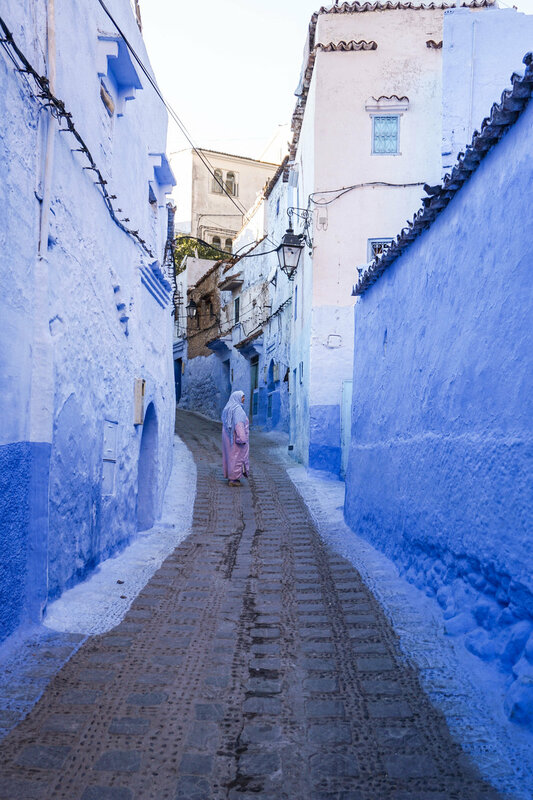 Have these photos made you want to go to Chefchaouen?